With a game like The Sims there are seemingly endless ways in which you can engage your Sims in various time-filling (or time-sucking, if you’re going by the player’s perspective) ways, however it’s the expansion packs that often introduce new interactions, jobs and activities that are game-changing enough to keep the game fresh and keep those of us who love to play house with hour Sim-families busy for hours and hours. Since the release of The Sims 3 last June, there’s already been one expansion pack released. World Adventures allows Sims to travel to three different countries, do adventures, acquire new skills and meet new people. They can even learn local songs and come home with an inventory full of treasure. 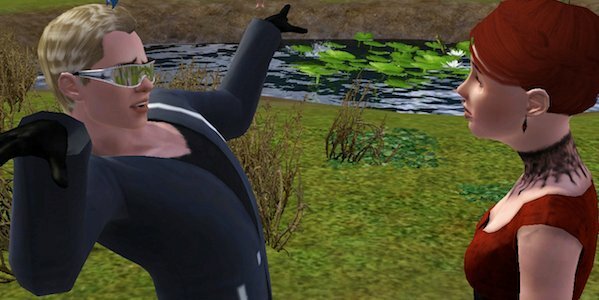 So what’s next for The Sims 3? We got the High End Loft Stuff Pack, but stuff packs are just stuff. Not exactly game changing. Having played The Sims since the original game’s release, I’m always looking for new ways to play the game. So here’s my wishlist for Sims 3 EPs, in no particular order. This one's not really my idea as there've already been rumors about an EP of this theme. If the rumors are to be believed, the next Sims EP might very well be “Hobbies and Professions (or some slightly less obvious and more clever sounding name because frankly, that one sounds a little too literal). From what’s been said, this might be to the Sims 2: Free Time EP what World Adventures was to The Sims 2: Bon Voyage. I didn’t play Free Time, however I do like the idea of an EP that introduces new careers and hobbies to the game. What could this EP include? My hope would be that in addition to one or two money-making jobs, the EA people might consider introducing some new low-paying career options for Sims who aren’t interested in getting rich when they reach the top of their career track. Nothing against making simoleons but I love the idea of making a Sim with a simple house and having them do a job like fire-fighting, mail delivery, teaching/professional tutoring, house-cleaning, babysitting (“nanny” work) construction work or a handy-man track or even something in the food industry and not getting rich. Sure, there are ways to make good money doing all of the mentioned jobs, but what about a track that doesn’t amount to much more than a middle-class income? The jobs could be “on call” gigs where the Sims are randomly called away to work. And on the other end, when Sims call to hire a repairman, fireman, professional tutor, maid or whatever, instead of an NPC showing up, someone in the neighborhood with that profession would come to the house to do the job. And in exchange for making a ton of money, the Sims could acquire a new “hidden” trait, or else some other game-related benefit when reaching the highest level of that track. Firefighters, teachers and mailmen could earn the “No bills ever” reward for reaching the top of the track. 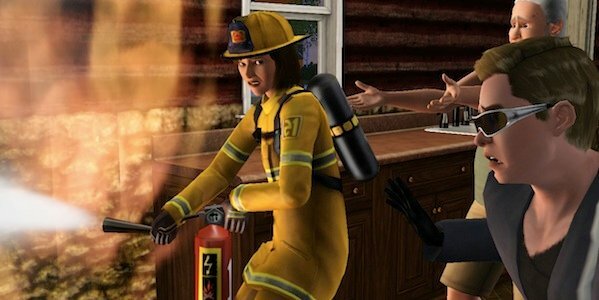 Or in the case of the firefighters, it would be an easier way to start breeding the hidden “pyro” trait into their families, rather than trying to seduce one of the NPC firefighters to get the job done. Construction workers could get a substantial discount on building costs or perhaps have the option to upgrade parts of the house, like the stairs, windows and doors to things not offered in build-mode. Food industry people could earn a substantial discount on food costs or they could gain access to new kinds of foods. I know we’re dealing with a new game here and for the most part, I barely think about Sims 2. I don’t even have it installed in this computer and the stack of EPs is collecting dust in my office. But it’s hard not to miss some of the things offered in the old EPs. I know there are plenty of people out there who miss Seasons, and I don’t really get that, personally. Nothing against rain or winter clothing but aside from the addition of “Gardening,” I didn’t really see a huge game-changing element in that EP. Sims 3 has gardening so as far as I’m concerned, I don’t think a S3: Seasons EP is necessary. They can throw some weather into another EP and that would probably appease most of the Seasons-lovers. Open for Business was easily my favorite of the Sims 2 EPs, and I’d love to see a lot of what could be offered in that EP if some variation of it were introduced into Sims 3. I’m not sure what I liked more, the option of being able to run a business out my Sim’s house, or the Servos. Servos were the robot-people that Sims who built up their skill with machine-making could make and either activate in their own home or else sell to someone else. The Servos were playable Sims with a taste for cleaning and tending to the house. Of course if it rained or they went swimming, they went crazy and had to be repaired but that was part of the fun. 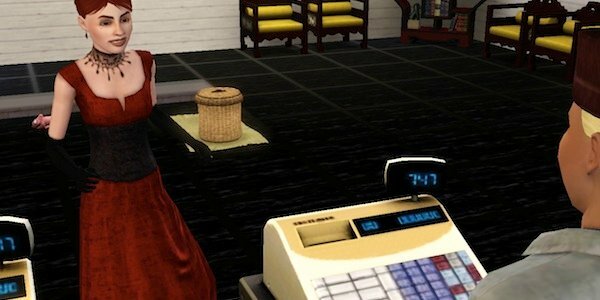 As for running a business, whether it was on a community lot or out of their home, the Sim made their own hours. And they could sell everything from stuff they made, to food they cooked or even stuff from buy-mode. With the option to customize the cosmetic appearance of pretty much every item in buy-mode in The Sims 3, we could have a lot of fun filling a Sims store and creating a signature style for the things they sold in a S3: Open for Business-type EP. I could take or leave a new version of Pets. Making dogs and cats in Sims 2 and bringing them into families was fun but having to care for them got old after a while. There are definitely some elements of Nightlife that could be introduced, including perhaps, an urban-looking neighborhood. There’ve been some great worlds made by players in “Create a World” but I’d love it if EA released some new neighborhoods to install into the game. We have the suburban Sunset Valley, the more rural Riverview. Now we need a Sims 3 version of Downtown! There’s so much water, why aren’t we using it? Even the pool has gotten more boring in Sims 3 as there’s no diving board or slide. The pool just sits there and most of the time my Sims don’t even bother with it unless I send them to swim. I also haven’t figured out how to get party guests into the pool yet. You can invite them over for a party and instruct them to wear their swimsuits but as far as I’ve seen, that just results in a bunch of guests standing around the buffet or dancing to the stereo in their bathing suits. Anyone know how to get them into the pool? Let’s step up the pool situation! As for the rest of the water, perhaps some use of the oceans, bays, lakes and ponds? Visiting the beach or a lake would be a lot more fun if Sims could swim in it. And maybe create a fishing or other maritime-themed job occupation. Sims in that career track may have to spend a couple nights away from home (and then get the rest of the week off) but they could come home with new fish or perhaps meet a nice mermaid to bring home to mom. 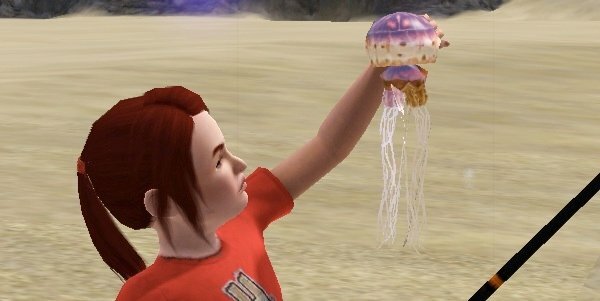 The Sims 3 version of Merpeople might have increased fishing and swimming abilities, an extensive knowledge of all fish-related recipes and positive moodlets for anything pertaining to water. What’s the opposite of the “hydrophobe” trait? Whatever it is, they have it. In addition to the above, introduce some new fish and dolphins because everyone loves dolphins. And to build onto World Adventures, perhaps they could introduce some pirate-related adventures into the other countries. I’ve seen some people on the Sims 3 forums talking about wishing they could send their Sims to the medieval age and there are some hairstyles, clothing and furniture available to download at the Sims store to cater to that. EA also recently added the “I love the fifties” collection, which makes me think they're open to exploring different eras, at least on a cosmetic level. But what about an EP that actually takes your Sims to different time periods? Meaning the entire neighborhood is set in a different time and depending on which era the neighborhood is, the game varies based on that. Perhaps a whole neighborhood that’s pre-technology. Maybe not centered on one specific time period. It doesn’t need to be historically accurate but let’s do away with paved roads, electricity and anything modern. Replace cars with carriages and horses. Sim children go to school until they’re teenagers and then start learning a trade. Insert new careers here (blacksmith, farmer, teacher, whatever). Another neighborhood could be a blend of the fifties, sixties and seventies, depending on how the player wanted to play it. Limited technology (no cell phones or computers), old-style cars, new activities for kids to play and different career tracks. Present-day wouldn’t be necessary as we’re already playing that but there could be a future world, complete with ridiculously modern clothing (see High End Loft’s wardrobe for examples of that), flying cars, space ships, floating houses and of course, the return of the Aliens. I never got the Apartment Life EP for The Sims 2 but I do like the idea of running multiple families on one lot. Each would have separate incomes and would be played separately but rather than having to save and leave a household to play another one, you could toggle between more than one family within the same active lot. This would protect the families you’re not playing at the time from major issues as far as the story progression is involved and it would allow a player to keep extended families together and stay on top of their progression in the game. So in addition to having the ability to create an apartment building, you could also create a trailer park, a set of condos, a duplex or even a cul-de-sac or small, gated community. The player would have the option to section-off different areas of the lot for each household within the lot. I think I’m suggesting this because I have this issue with a set of kids all growing up around the same time and not being able to decide which of them I want to focus my time on in terms of developing their career and family status once they move out. It’d be nice to be able to keep them closer together, while at the same time not having to play them all at once. A household with the maximum of eight residents can be kind of a pain to deal with but once they’re separated, it can be easy to forget to jump back to the Sims you’re not playing. This is one of the drawbacks to the Sims 3 format as compared to Sims 2. In the previous version of the game, time stood still for the households you weren’t playing. For the most part, I prefer Sims 3’s approach as the game takes care of the households I’ve gotten bored with or moved on from in general but on the down-side, it means that life’s going on for those inactive households and there’ve been plenty of times that I’ve returned to a household after a Sim-week or so and found the house split up with spouses moved out, in love with someone else, in trouble with their job (or in a completely new job) and generally out of whack with what I had planned for them. Other times, I can’t find them at all. Some new family’s living in their house and my Sims are off the map. As far as I can tell, when that happens the only way to get them back is to find a Sim that knows them, play them and get the family to move in, then move out to their own house. That might be a story-progression glitch or the game’s way of making room in the neighborhood. Regardless, I think some way to keep a tighter hold on certain families would be a big help and the idea of keeping them all on the same patch of land but not have to play them all at once appeals to me. What's Your Pick For The Next Sims 3 Expansion Pack? Bring Back the Old Stuff!